The collect and readings for Christmas Day may be found here. The appointed gospel was John 1:1-14. In the beginning was the Word, and the Word was with God, and the Word was God. 2He was in the beginning with God. 3All things came into being through him, and without him not one thing came into being. What has come into being 4in him was life, and the life was the light of all people. 5The light shines in the darkness, and the darkness did not overcome it. 6 There was a man sent from God, whose name was John. 7He came as a witness to testify to the light, so that all might believe through him.8He himself was not the light, but he came to testify to the light. 9The true light, which enlightens everyone, was coming into the world. 10 He was in the world, and the world came into being through him; yet the world did not know him. 11He came to what was his own, and his own people did not accept him. 12But to all who received him, who believed in his name, he gave power to become children of God, 13who were born, not of blood or of the will of the flesh or of the will of man, but of God. St. John’s version of the Christmas story is quite different from the one we heard Christmas Eve. St. John takes us beyond the external setting of Jesus’ birth. In John’s account we do not go to Bethlehem, we do not see Mary and Joseph, and there is no baby in a manger. We do not hear the singing of angel choirs. Shepherds are not guarding their flocks by night and wise men do not come from afar bearing gifts. In the beginning was the Word, and the Word was with God, and the Word was God. He was in the beginning with God. All things came into being through him, and without him not one thing came into being…. And the Word became flesh and lived among us, and we have seen his glory, the glory as of a father’s only son, full of grace and truth. We can hear the echoes of the Genesis creation story. “In the beginning God said…. And there was…” light, sky, land, vegetation, living creatures from the water, birds of the air, living creatures from the earth, and humankind made in the divine image, according to the divine likeness (Genesis 1:1-27). John continues that great story of creation. In the gospel according to John it is as if God is saying, “Let us and humanity be one. Let us participate in each other’s lives. Let the Word become flesh and live among humanity. Let humanity have the power to become my children, born not of blood or of the will of the flesh or of the will of man, but of God.” And there was the incarnation. 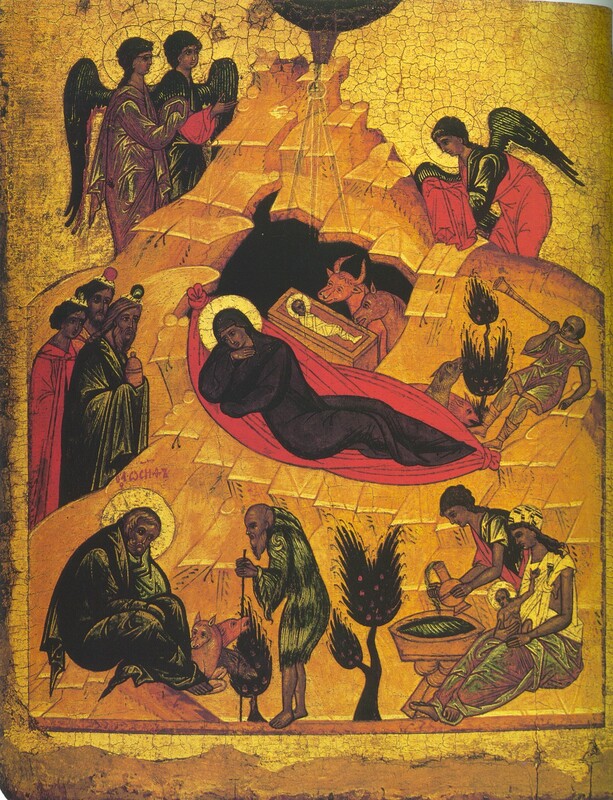 John’s Christmas story, However, is not simply one of continuing creation and incarnation. It is the story of ecstasy. Ecstasy is at the heart of the incarnation as well as every act of true creation. Not very often do we speak or hear about ecstasy in the Church. But Christmas Day, perhaps more than any other day in the liturgical year, speaks of ecstasy. The literal meaning of ecstasy (in the Greek, ekstasis) is to stand outside of oneself. It is a movement from self to the other. With the Word’s becoming flesh, God came out of himself in a movement of love. He is the ecstatic God who, as St. Dionysius the Areopagite says, comes out of himself to meet us going out of ourselves to meet him. God initiates the ecstatic act and invites our ecstatic response. For union always demands a double movement – a movement from God out of himself as well as a movement from humanity out of itself. This double movement of God to humanity and humanity to God, the mystery of reciprocity, finds its fullest and most complete expression in the God-Man, Jesus. The Son of God became the child of a human mother in order that the sons and daughters of human mothers might become children of God. The gift of Christmas is ecstasy and ecstasy always invites ecstasy.